At the end of season 1, it seemed as though Fear the Walking Dead had lost (or run from) its identity, the one thing that distinguished it from the series that spawned it. This was a show set in the early days of the zombie apocalypse, and therefore it was positioned to tell the sort of story The Walking Dead glossed over. Instead of careening into a bleak outlook on human nature and a series of violent conflicts between survivors, Fear was, for a short time, something else. It was a surprisingly claustrophobic series that bordered on actual horror. It was a show interested in the slow collapse of society, but even more interested in having it be seen through the often-blinkered eyes of characters prone to steeling themselves behind doors and giant metal shutters and the occasional venetian blind. As such, the six-episode first season took on a distinct but fleeting personality, one that ostensibly went up in flames along with the greater Los Angeles area by the season's end. When season 2 begins, then, there's a sense that showrunner Dave Erickson has set a new course for the show as well as his gaggle of survivors with the intention of rediscovering that lost identity. Barring a renewal of what made the show unique, there's always the appeal of diving headlong into the promised nautical-themed direction with the belief that waterlogged zombies and maritime human-on-human violence will satisfy those hanging around Sunday nights waiting to find out who Negan conked on the head with his anthropomorphized baseball bat. The intention of the series to redefine itself and to establish a new hierarchy amongst the core characters – from which will come The Walking Dead's patented sense of nuance-free conflict – works in odd ways throughout the first hour. Titled 'Monster,' the season premiere begins largely where last year's finale left off. The survivors are scrambling to make their way to Victor Strand's (Coleman Domingo) luxury yacht, Abigail, as LA goes up in flames and a series of well-timed explosions herald the arrival of the titular fearsome dead, making for a tense opening sequence wherein Travis (Cliff Curtis) and Madison (Kim Dickens) hold off a slew of zombies as Chris (Lorenzo James Henrie) fulfills his duties as Difficult TV Teen. But the chaos of the opening is short-lived and once the survivors are packed aboard Strand's boat, 'Monster' settles into a series of familiar domestic rhythms that may have made the first season feel like it was executive produced by Jason Katims, but are less engaging now that the series has taken to the high seas. Watching the hour, you get the sense that FTWD wants to reestablish its characters' naiveté with regard to the situation they have miraculously survived and, in comparison to many of the people they allow to float on by – or by the end of the hour, hope to avoid – come out looking pretty good. This is especially important given Strand's increased presence as one of the show's three alpha males, who, at this point holds all the cards, seeing as how the floating mansion everyone is enjoying the relative safety of belongs to him. That familiar bickering rears its head again and again throughout the episode, as various characters contemplate helping fellow survivors while the intensely pragmatic Strand refuses, reminding everyone again and again, "I filled my mercy quota… It's my boat." The hour is attempting to demonstrate just how brutal and seemingly ruthless the learning curve is – or has to be – under the new circumstances. There are those like Madison who are quick to understand, if not entirely endorse, Strand's position that, as survivors, they can't risk taking on any more passengers unless there is a distinct advantage that would outweigh the increased burden of another mouth to feed and another opinion to inevitably shoot down. Despite Strand's engaging presence, there's a stubborn feeling the hour is crossing over (or swimming across) well-trodden territory. 'Monster' is trying to establish once again just how drastically the world has changed, how basic human decency has been thrown overboard and any attempt at compassion is simply chumming the waters for whatever gun-toting apex predator happens to be in the area. That's the lesson learned by the thread given to Alicia (Alycia Debnam-Carey), who spends her first few hours on the Abigail chatting up another lonesome survivor and basically giving away the yacht's position to what could be characterized as a group of pirates. Fear is actually rather successful in making Alicia's mistake understandable and applicable given her circumstances; it's even somewhat tense given what the audience knows about the way the series works. The only problem is that in putting so much focus on Chris' grief-fueled-but-still-moody-teen antics, the potentially engaging consequence of Alicia's mistake winds up pulled like a dinghy behind the vessel that is the show's new, overarching structure. In other words, the dreaded cliffhanger strikes again. Although 'Monster' moves at perhaps too deliberate a pace for a season premiere, revisiting many of the same conversations and arguments that have stalled its older sibling on more than one occasion, there's still hope that the loose outline of the series' new structure will usher in a new and exciting narrative over the next seven weeks and beyond. 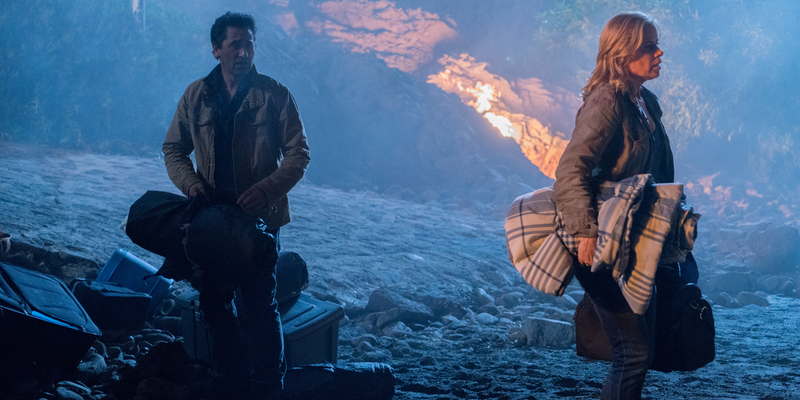 The idea that Fear the Walking Dead might see the survivors aboard the Abigail moving from destination to destination, encountering new characters every so often and getting involved in what will hopefully be their engaging narratives, helps breathe new life into a series that seemed poised to become that pale facsimile of The Walking Dead. Sadly, like the ending that only intimates danger is on the horizon, proof that season 2 will set the series onto a more kinetic path is so far just a blip on the radar.